Register for both Adult Group Lessons and Private Lessons! Attention All BVTC Adult Members! 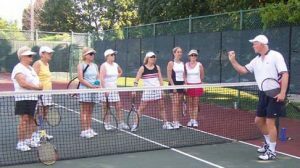 The BVTC outdoor tennis season is just around the corner (club opens Sat. April 13). Adult Lesson Programs will start up on May 1, 2019. Now is the time to register for both Adult Group Lessons and Private Lessons. To register, go to our LESSONS page, download and print off the attached Adult Lessons registration form; fill it out and send back by mail with your cheque to the return address listed on the form.